Uhh wowzaaa! It seriously feels like forever and a day since I did my last blog post - just over 2 months to be exact! What can I say? It has been a CRAZY busy few months both in my work life and personal life, you know how it gets right? One minute it was July and next thing I know we are suddenly in September, golly damn. Unfortunately blogging had to take a back seat for a little while, but now I'm slowly starting to get back into the swing of things and fingers crossed will hang around for the time being in blogging land! I missed you all so much! So I thought today's post would be a little review of a treatment that I was luckily enough to try back in July (feels like so long ago now!) If you have been keeping up with my past blog posts you would be no stranger to my love for Dermalogica, so when I was asked to try their new IonActive Power Treatment naturally my answer was a resounding yes. 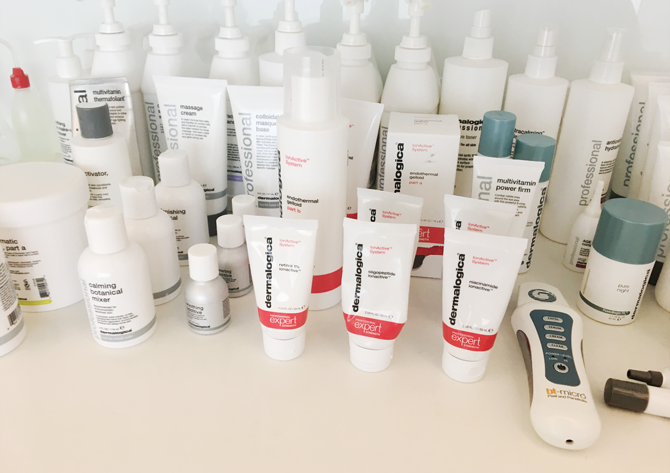 Dermalogica are one of the very few brands whose products get along so well with my skin, and who I am to break up a good thing going? Plus, who doesn't love a sneaky facial every now and again? Dermalogica's IonActive Power Treatment* is a 45-minute professional skin treatment that is a personalised to address certain skin conditions such as acne, dehydration, skin sensitivity, and skin ageing, drawing from results driven and professional only formulas. 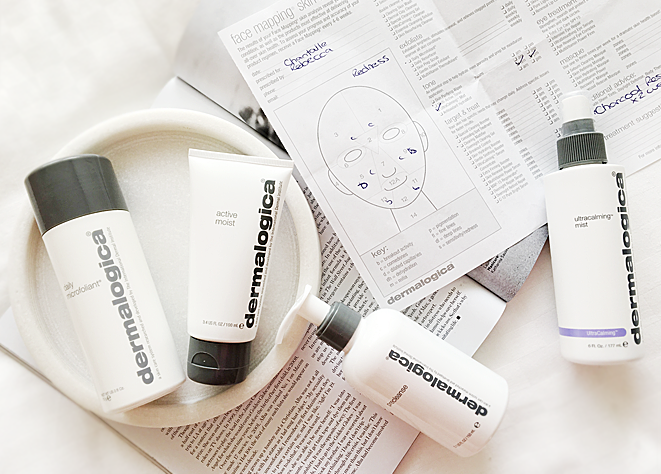 My treatment was at Dermalogica's Sydney head office and it began with their face mapping process after I had filled out a quick but very detailed questionnaire. I have actually had my face mapped by Dermalogica once before, but basically the face mapping works to highlight various skin concerns in different areas of your face. As expected, my main concerns are redness, skin sensitivity and breakouts cross my cheeks, chin and forehead - but I am pleased to report that fine lines and skin ageing were not one of them (thank you eye-cream!) With this in mind, my treatment would be designed to focus on redness, sensitivity as well as scarring and congestion (some of my fave things y'all) using the Niacinamide IonActive to treat breakouts, congestion and sensitivity. My treatment was done by the super lovely Rebecca who was not only very welcoming but extremely knowledgeable and happy to answer all of my questions. The first step was to remove my make-up using Dermalogica Precleanse and Special Cleansing Gel. This was then followed by a facial steam to help open up my pores to make it easier to remove toxins from the skin as well make my skin more receptive to treatment. Although my facial had just begun, at this point I was already in heaven and just about ready to take a teeny nap, that's how relaxed I was! Next up was the prescribed Niacinamide IonActive treatment which was applied all over my skin. Rebecca promised my skin would be much less oily (yay! ), calmer and generally less sensitive after my treatment thanks to this guy (and boy she was sooo right, but more on that later!) Once the treatment serum was applied, light therapy was used to help enhance the effectiveness of the products. In my case blue LED light was used to help congestion and redness. Red LED light can also be used to address ageing and dehydrated skin. This was definitely one of my favourite parts of the facial. The blue light was strangely quite soothing, not only on my skin but on my senses as well - I honestly don't think I could have been more relaxed if I tried! It also made me feel that the products were working overtime to really penetrate deep into the skin. Once the light therapy was finished an EndoThermal Gelloid massage was the applied to my skin. The gel offered a cooling sensation that felt absolutely amazing. Rebecca informed me that this was applied to specifically help address redness, soothe sensitive skin and reduce inflammation. A roller was then used to deeply cleanse and further drive the active ingredients into the skin. To finish off, Rebecca gave my face a light massage with her fingers as well as cold stones, and before I knew it my facial was (sadly) over. I was prescribed a few extra Dernalogica products to continue using and slot into my already expansive skincare routine including Dermalogica Ultra Calming Mist to help with my skin redness and Dermalogica Active Moist, a light weight but incredibly hydrating moisturiser. So what's the final verdict? My skin after the treatment could not look more amazing if I tried. My skin is usually quite red on a daily basis but after my facial there was zero to no redness in sight. My skin felt hydrated, soft and deeply cleansed. The best bit however was that my skin did not (I repeat DID NOT) get oily for the rest of the day *happy dance* In fact my skin quite literally glowed for the rest of the week, and produced much less oil than usual. My skin was most definitely in its best shape, the best it has been in ages quite frankly! Although it is advised that the best results will be seen after 3-6 treatments, one was more than enough to see the difference in my skin, I can only imagine how amazing it would look after 6! I highly recommend the Dermalogica IonActive Power Treatment for anyone looking to address specific skin issues. With such little downtime involved, I would even suggest this to anyone who is looking to whip their skin back into shape before an event or just because! Just thinking back to how amazing my skin was has me wanting to book another treatment pronto! treatment centres from $140 per treatment. 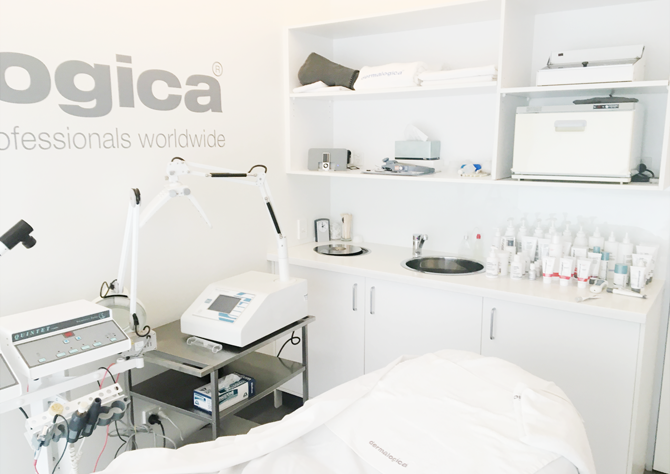 For more information on IonActive Power Treatment and qualified skin centres visit www.dermalogica.com.au. 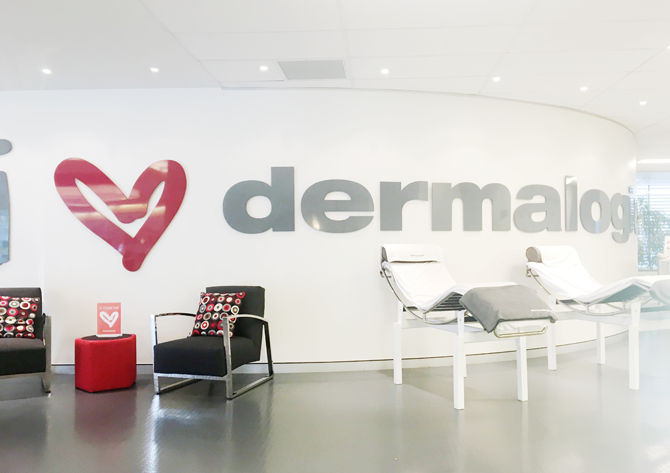 Have you tried any of Dermalogica's facial treatments before? Let me know your thoughts below! *This treatment and products provided were for consideration of a review. This post is NOT sponsored in any way, and it does not impact my thoughts or opinions. For more information please read my disclaimer policy here. HEY!!! So glad to have you back! This treatment sounds amazing! Mumma needs something like this ASAP to feel better about myself! haha <3 Can't wait to read more of what you have coming up! !